The latest issue of the Automotive News Europe monthly e-magazine goes live on Monday, March 2. 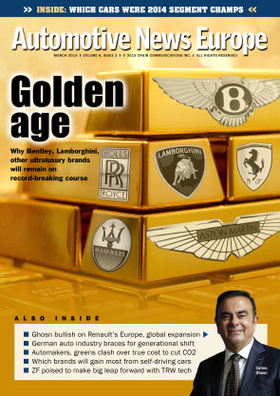 This month's edition looks why ultraluxury brands such as Bentley, Lamborghini, Rolls-Royce and Maserati are poised to keep experiencing unprecedented success. The highly exclusive segment as a whole is forecast to grow by nearly 40 percent between now and 2020, peaking at more than 86,000 in 2018. Our cover story section on ultraluxury brands also includes interviews with three chief executives who led their companies to record deliveries in 2014. Bentley CEO Wolfgang Duerheimer discusses the positive effect his brand is already seeing ahead of plans to launch the Bentayga, its first SUV. Lamborghini boss Stephan Winkelmann explains why he foresees another record sales year. Rolls-Royce head Torsten Mueller-Oetvoes also expects growth to continue in 2015. Our cover package concludes with a look at the models that led Europe’s exotic segment last year and what to expect from the niche in 2015. Renault-Nissan CEO Carlos Ghosn remains confident that by 2018 his seven-brand alliance will rank as one of the world’s three largest automakers. He sees the alliance rising from No. 4 now despite big troubles in Russia and finishing about 1.4 million units behind third-ranked General Motors last year because, as he puts it: “A lot of things can happen in three years." Automakers say the cost they face to meet stricter European CO2 limits is rising rapidly, while environmentalists disagree. Recent research estimated that automakers will spend 13 billion euros to achieve the lower CO2 goal, up from 12 billion euros a year ago. Germany’s automotive ranks are undergoing a generational shift. When Harald Krueger becomes CEO at BMW Group and Herbert Diess takes over as chief at the Volkswagen brand this year, four of the six heads of Germany’s biggest automotive brands will be in their early or mid-50s. We look at the challenges facing this new wave of executives. Data protection is becoming a hot topic in the auto industry, with some suggesting that car owners one day will have to log into their vehicles just as they do with their desktop computers. The buzz about autonomous driving continues to grow. Many auto executives expect fully autonomous vehicles to debut in the next 10 years while others wonder whether motorists will want to give up control to a computer. Our Latest Launches section looks at what Ford says is the “most technologically advanced car” it has launched in Europe, the new Mondeo, and the Land Rover Discovery Sport, which the British SUV maker expects to lure a high percentage of new customers to the brand because of its seven-seat configuration. Our supplier section looks at the implications of ZF Friedrichshafen’s acquisition of TRW Automotive on the future of driverless cars and explains how Spanish supplier Gestamp used the global financial crisis of 2008-2009 to make itself even stronger.